Cumin (IPA pronunciation [ˈkʌmɪn] sometimes spelled cummin) is the common name for a small, herbaceous annual plant, Cuminum cyminum, in the parsley family (Apiaceae), characterized by pinnate or bipinnate leaves with threadlike leaflets, small white or pink flowers borne in umbels, and a seedlike fruit. The name also is used for the dried, crescent-shaped ripe fruit, which is used as a popular spice. Another name used is Roman caraway. 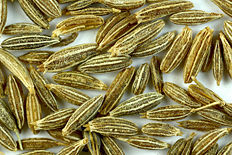 Cumin (Cuminum cyminum) is sometimes confused with caraway (Carum carvi), also called Persian cumin, which produces similar crescent-shaped, seedlike fruits used as a spice, but they belong to different genera. Likewise, black cumin (Nigella sativa), whose seeds are used as a spice, and sweet cumin or anise (Pimpinella anisum) are different plants. Another species known as black cumin is Bunium persicum and its dried fruits also are used as a spice. With its distinctive, strong, pungent flavor and odor, cumin, whether in seed or ground forms, is a staple of many cuisines, with particular popularity in Middle Eastern, Indian, Cuban, and Mexican cuisines. It is used in curry and chili powders, for instance. Furthermore, the essential oil is used in perfumes and flavoring liqueurs, and there also are various medicinal values attached to cumin. Cumin belongs to the carrot or parsley family, Apiaceae. 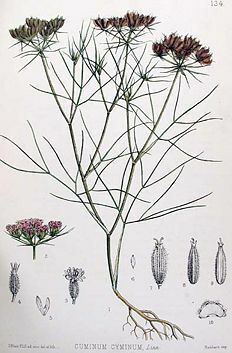 Also known as the Umbelliferae family (both names, Apiaceae and Umbelliferae, are allowed by the International Code of Botanical Nomenclature), this family comprises unusually aromatic plants with hollow stems, including the parsley, carrot, parsnip, dill, caraway, fennel, and other relatives. The family also includes some highly toxic plants, such as hemlock. Apiaceae is a large family with about 300 genera and more than 3,000 species. The earlier name Umbelliferae derives from the inflorescence being in the form of a compound "umbel." The small flowers are radially symmetrical with five small sepals, five petals, and five stamens. Cuminum cyminum, or cumin, is the only extant (living) species in its genus. It is a small annual herb with a slender branched stem 20 to 30 centimeters (8 to 12 inches) tall. The leaves are five to ten centimeters (two to four inches) long, pinnate or bipinnate, with thread-like leaflets. The flowers are small, white or pink, and borne in umbels. The fruit (commonly but imprecisely called seed) is a lateral fusiform or ovoid achene four to five millimeters (about three-sixteenths of an inch) long, containing a single seed. Cumin "seeds" are similar to fennel seeds in appearance, but are smaller and darker in color. 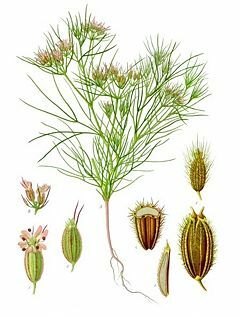 Cumin is hotter to the taste, lighter in color, and larger than caraway (Carum carvi), another umbelliferous spice that is sometimes confused with it. Many European languages do not distinguish clearly between the two. 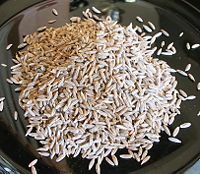 For example, in Czech caraway is called "kmín" while cumin is called "římský kmín" or "Roman caraway." Some older cookbooks erroneously name ground coriander as the same spice as ground cumin (GT 2007). The distantly related Bunium persicum, in the same plant family, and Nigella sativa in the Ranunculaceae family, are both sometimes called black cumin. Cuminum cyminum is native from the east Mediterranean to East India. Cultivation of cumin requires a long, hot summer of three to four months, with daytime temperatures around 30°C (86°F); it is drought tolerant, and is mostly grown in Mediterranean climates. It is grown from seed sown in spring, and needs a fertile, well-drained soil. Historically, Iran has been the principal supplier of cumin, but currently the major sources are India, Sri Lanka, Syria, Pakistan, and Turkey. Cumin seeds are used as a spice for their distinctive aroma. They are available in whole seed and ground forms. Cumin's distinctive flavor and strong, warm aroma is due to its essential oil content. Its main constituent and important aroma compound is cuminaldehyde (4-isopropylbenzaldehyde). Important aroma compounds of toasted cumin are the substituted pyrazines, 2-ethoxy-3-isopropylpyrazine, 2-methoxy-3-sec-butylpyrazine, and 2-methoxy-3-methylpyrazine. This spice is popular in North African, Middle Eastern, Western Chinese, Indian, Cuban, and Mexican cuisine. The flavor of cumin also plays a major role in Thai and Vietnamese cuisines. Historically, cumin was used heavily in ancient Roman cuisine. Cumin is well known as an ingredient of curry powder, and also is a critical ingredient of chili powder. It is found in achiote blends, adobos, sofrito, garam masala, and bahaarat. Cumin can be found in some Dutch cheeses like Leyden cheese, and in some traditional breads from France. It is also commonly used in traditional Brazilian cuisine. Cumin is one of the ingredients in the spice mix berbere. Cumin can be used to season many dishes, as it draws out their natural sweetnesses. It is traditionally added to curries, enchiladas, tacos, and other Middle-eastern, Indian, Cuban, and Mexican-style foods. It can also be added to salsa to give it extra flavor. Cumin has also been used on meat in addition to other common seasonings. The spice is a familiar taste in Tex-Mex dishes. Cumin seeds are often ground up before being added to dishes. Cumin seeds are also often toasted by being heated in an ungreased frying pan to help release their essential oils. In herbal medicine, cumin is classified as stimulant, carminative, and antimicrobial. It is believed to help induce labor in a woman who has gone post-dates with her pregnancy. In Sri Lanka, toasting cumin seeds and then boiling them in water makes a tea used to soothe acute stomach problems. Cumin is also said to help in treatment of the common cold, when added to hot milk and consumed. Rahman et al. (1999) found cumin to have significant antifungal activity. Superstition during the Middle Ages cited that cumin kept chickens and lovers from wandering. It was also believed that a happy life awaited the bride and groom who carried cumin seed throughout the wedding ceremony. Cumin has been in use since ancient times. Seeds, excavated at the Syrian site Tell ed-Der, have been dated to the second millennium B.C.E. They have also been reported from several New Kingdom levels of ancient Egyptian archaeological sites (Zohary and Hopf 2000). Originally cultivated in Iran and the Mediterranean region, cumin is mentioned in the Bible in both the Old Testament (Isaiah 28:27) and the New Testament (Matthew 23:23). It was also known in ancient Greece and Rome. The Greeks kept cumin at the dining table in its own container (much as pepper is frequently kept today), and this practice continues in Morocco. Cumin fell out of favor in Europe except in Spain and Malta during the Middle Ages. It was introduced to the Americas by Spanish colonists. Since returned to favour in parts of Europe, today it is mostly grown in Iran, Uzbekistan, Tajikistan, Turkey, Morocco, Egypt, India, Syria, Mexico, and Chile. The English "cumin" came from the the French "cumin" that was borrowed indirectly from Arabic "Kammon كمون" through Spanish "comino" during the Arab rule in Spain in the fifteenth century. This makes sense because this spice is native to Syria (an Arabic speaking country) where cumin thrives in its hot and arid lands. Cumin seeds have been found in some ancient Syrian archaeological sites. The word found its way from Syria to neighboring Turkey and nearby Greece most likely before it found its way to Spain, but like many other Arabic words in the English language, cumin was acquired through Western Europe rather than the Greece route. Some theories suggest that the word is derived from the Latin cuminum and Greek κύμινον, however, this is unlikely. The Greek term itself has been borrowed from Arabic. Forms of this word are attested in several ancient Semitic languages, including kamūnu in Akkadian. The ultimate source is a native Syrian language that could be the Sumerian word gamun (American Heritage 2000). A folk etymology connects the word with the Persian city Kerman, where, the story goes, most of ancient Persia's cumin was produced. For the Persians, the expression "carrying cumin to Kerman" has the same meaning as the English language phrase "carrying coals to Newcastle." Kerman, locally called "Kermun," would have become "Kumun" and finally "cumin" in the European languages. In India and Pakistan, cumin is known as jeera or jira or sometimes zira; in Iran and Central Asia, cumin is known as zira; in Turkey, cumin is known as kimyon; in northwestern China, cumin is known as ziran. In Arabic, it is known as al-kamuwn (ال). Cumin is called kemun in Ethiopian. ↑ The pronunciations /ˈkuːmɪn/ and /ˈkjuːmɪn/ are becoming increasingly common. American Heritage Dictionary of the English language (American Heritage). 2000. Kmm Houghton Mifflin Company. Retrieved May 11, 2008. Growing Taste (GT). 2007. About Cumin (Cuminum cyminum) Growingtaste.com. Retrieved May 11, 2008. Rahman, A., M. I. Choudhary, A. Farooq, A. Ahmed, M. Z. Iqbal, B. Demirci, F. Demirci, and K. H. Can Baser. 1999. Antifungal activities and essential oil constituents of some spices from Pakistan Third International Electronic Conference on Synthetic Organic Chemistry (ECSOC-3). Retrieved May 11,2008. This page was last modified on 7 November 2011, at 14:51.